Award-winning Jim Gaffigan, stand-up comedian, voice actor, writer, author and actor is bringing his much-loved comedy routine to the DTE Energy Music Theatre on Friday 21st July 2017!! Tickets will sell out fast for Jim Gaffigan and his enthusiastically received, brand new “Noble Ape,” tour, so don’t delay! Click the “Buy Tickets,” button above to get yours TODAY!! 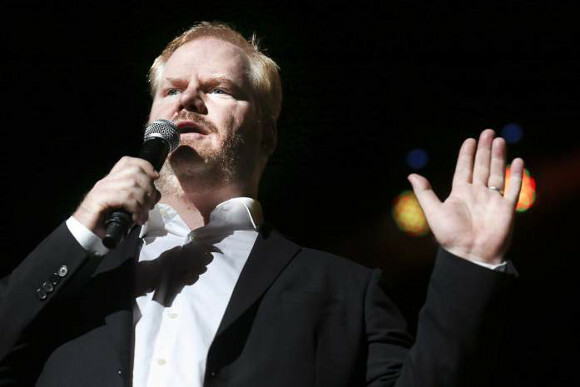 Born in 1996 to a large family of six siblings (a common joke topic of his in tandem with his own family which now includes five children), Gaffigan decided very early to pursue acting and comedy, despite the wishes of his father to seek secure and stable jobs. After graduating university and taking up a job in advertising, he took acting classes at night and was encouraged by a classmate to try stand-up. He fell in love with it, and started to perform in earnest, playing comedy clubs on a nightly basis, trying various styles until he eventually found the observational style so well-loved by his fans today. After a memorable performance on The Late Show with David Letterman, he reached a widespread audience across the world. Known for his family-friendly, clean brand of comedy, centered around topics such as laziness, eating, and parenthood. The Atlantic said of him that he retained “a vital element to standup that (Lenny) Bruce had taken away—the indispensable, but apparently forgotten idea that comedians have no obligation to be provocative, topical, socially conscious, or anything else but funny." Don’t miss your chance to see this fantastic comedian live – get your tickets today! !